I’ve told this story before, but, when my wife told me that we were going to have our first child, the following day, I drove to the bookstore and I bought my yet-to-be-born daughter a copy of The Phantom Tollbooth by Norton Juster and Jules Feiffer. And I listened. The best part was I already owned a copy of The Phantom Tollbooth, but I wanted her to have her own copy. It felt important to me and, to be honest, it still does. 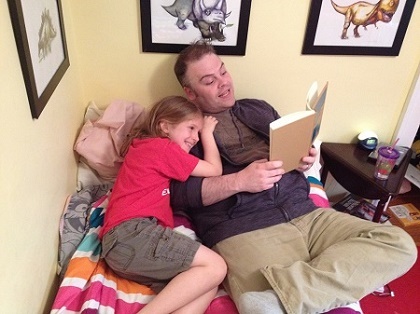 From that first moment, I KNEW, I knew in my bones, that reading was going to be an absolutely essential part of being a father and I wasn’t wrong. During my wife’s pregnancy, as I sat there thinking about what could I EVER impart to a young child that would ever be worth a damn, my mind kept coming back to the same answer – BOOKS. I could give her books. That didn’t mean I had to BUY her a lot of books (even though I did). It just meant I had to introduce her to books. I had to lead her to books. And that responsibility unlocked something primal in my brain that I didn’t know was there before. For the first time in a long while, I was driven. I had purpose. I was a DAD and I had a job to do. I had to introduce my daughter to Alexander and teach her about the statistical certainties of eventually having a terrible, horrible, no-good very bad day. I had to make sure that she knew not to trust wolves, or grandmothers who look suspiciously like wolves, or pigeons who swear up and down that they know how to drive a bus. (They lie.) I had to reach back into the lore of our ancestors to regale my daughter with stories of knights and gods and legends, so that she could know the foundation of our shared cultural mythology and, more importantly, so that she could laugh her head off when she saw those myths exploded in books like The Stinky Cheese Man or The Paper Bag Princess. I had to be… a giver. No, THE Giver. 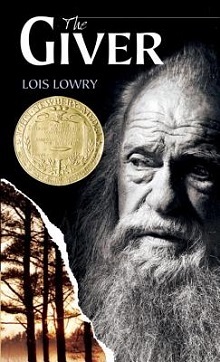 I had to be Lois Lowry’s The Giver because, c’mon, LOOK at that man on the cover and tell me that he isn’t one of the manliest men you’ve ever seen. Every time I read with my daughter, I feel like I’m giving her something. Every bedtime story is a rite of passage. I am the chief and she is the initiate. Every word I read to her becomes a part of her, like we’re sitting around a fire, handing down tribal knowledge, making her more of an adult each and every time we finish a story, no matter how much it breaks my heart to watch the baby she once was slowly leave her face. It is an understatement to say that I don’t understand dads who don’t read to their kids. They baffle me. Every testosterone-marinated bone in my body screams out “DADS READ!” and I simply can’t comprehend how any father can hope to introduce their child to the weird, wonderful world we live in without having a book – lots of books – by their side. Oh, and, in case you were wondering, my daughter didn’t really care for The Phantom Tollbooth. (Which devastated me.) Maybe reading it with her when she was five was too young. Maybe I should’ve waited until she was older. Ah well, it’s not my job to make her love the books I love. I’m a dad. I just point her in the right directions and watch her go. This post originally appeared on the Reading Rainbow blog, which is AMAZING, right? Reading-frickin-Rainbow. Isn’t that cool? What a great post! Keep spreading the good word! The kids we work at The Reading Network need their dads to model that love of reading, and read with them and to them, so much! I love that the pic in this article shows you with your daughter, at an age when she is likely reading herself… we need to keep reading to them, long after they are reading to themselves, to make them reach for and enjoy those complex story lines, and to talk about humanity and all the lessons in books.